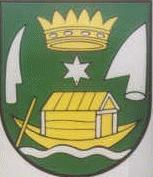 Horný Bar - Felbár municipality flag. Based on the photo taken by me on 17th August 2001. Fel means Felső (archaic short form, some really old Hungarian settlements have this version). Fel = Felső; in Slovakian: Horný; in English: Upper.